Vermiculite is the mineralogical name given to hydrated laminar magnesium-aluminum-iron silicate that resembles mica in appearance. About 80% of all vermiculite mined in this country came from Zonolite Mountain in Libby Montana. 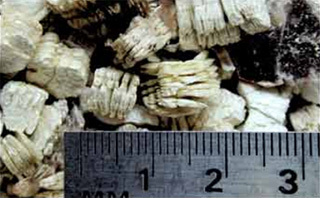 Vermiculite ores from some sources but not all, have been found to contain asbestos minerals however keep in mind that asbestos is not intrinsic to vermiculite and only a few mine have been found to contain more than tiny trace amounts of asbestos, namely Tremolite and/or Actinolite Asbestos. 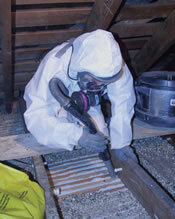 Vermiculite is often found installed behind wallboards, floorboards and commonly in attic spaces as a form of insulation. It was also used to provide texture in texture ceiling sprays and plaster. Removal of the vermiculite insulation may not be necessary if it is confined in a manner where it will be left undisturbed. However if the vermiculite will be disturbed due to demolition or renovation project, it is best to have the vermiculite tested at an accredited asbestos lab and removed by trained professionals. Universal Environmental Services professionals use a specialized industrial vacuum system built specifically for the removal of hazardous vermiculite. 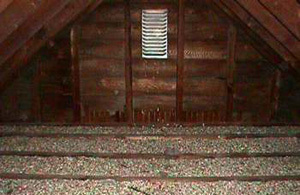 The area is sealed in a negative pressure enclosure to encapsulate any airborne dust, including asbestos fibers, to prevent them from escaping into your home.